The battle statistics are horrifying. 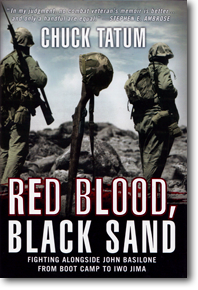 Red Blood, Black Sand is Chuck Tatum's true story, his first-hand account of Iwo Jima, the Marine Corps' most savage battle. This is the story of Chuck's two weeks in hell, where he fought alongside John Basilone and watched his hero fall, where enemy infiltrators stalked the night and snipers haunted the day. Stockton marine, Chuck Tatum, poses with poster picture of his Marine Corps hero, Gunnery Sergeant Minila John Basilone. 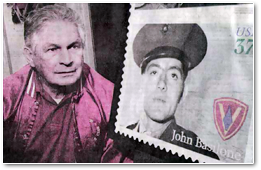 Sergeant Basilone used PFC. Tatum and his machine gun crew when attacking and destroying a major Japanese block house on the black sand beaches of Iwo Jima. Proclaimed best documentary of World War II by the Washington Post. In this hour and a half hour production the Marines tell their own story about the hellish 36 days it took to capture this island fortress of death. Eight sq. miles of volcanic landscape and Japanese forces gave the United States Marines the toughest battle in their 170 year history. 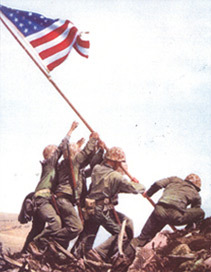 Rare combat color footage helps tell the true story about the battle for the Japanese held island of Iwo Jima. It will amaze you. copyright © 2019 MarinesWWII.com - Website Design by iSelect Internet iSelect Internet provides Website design, hosting and programming.